If it’s time to replace your home’s siding and you’re looking for an alternative to wood or vinyl, it’s worth looking at fiber-cement siding. 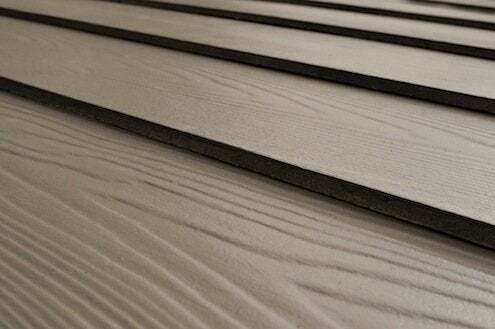 It’s become increasingly popular over the last decade or so, because as a mixture of wood and fiber and cement, fiber-cement siding looks like wood clapboards but is predicted to last even longer. It’s heavy, and you need some special tools to work with it, like cement shears or a carbide scoring tool, but you can cut it with a diamond or carbide blade on a circular saw, as long as you wear a dust mask. One key advantage of fiber-cement siding is that it holds paint beautifully and longer than wood. It now also comes pre-painted, so you can skip the painting altogether if you find a stok color you life. You can get caulking pre-tinted to match the color, so you can get a finished look and allow for the necessary expansion joints without seeing them. Best of all, termites and fire both hate cement, so fiber cement siding provides a level of protection from the elements that wood and vinyl can’t.